MindField is a leader in online technology and data collection. 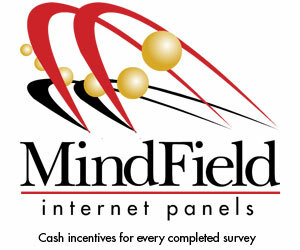 MindField also boasts the most in-depth, targeted panels available. Visit their website today and become part of the industry's leading internet panel. They are also one of the only panel companies that pay a cash incentive for every client survey you participate in. What could be better? You actually get paid for your opinions which means your opinions really do count. Choose Paypal, check, or a gift card.